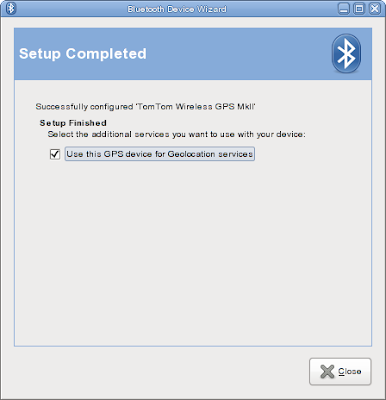 I updated gnome-bluetooth in Fedora 11, and that new version supports Secure Simple Pairing, an easier pairing mode for Bluetooth 2.1 devices. The update currently lives in the updates-testing repository, but will be in the normal updates when we've had enough good feedback about it. If you have Bluetooth devices in your possession that don't work as expected with your systems, and fancied a bit of playful testing, find me at GCDS, and we'll try and fix that. I was pointed today to this blog, which shows the integration work being done in KDE with fprintd. Happy to see all that work on the daemon and the documentation is coming to good use. I tried to beat the wash cycle on my washing machine at doing something useful. Tried to add Introspection support to gnome-bluetooth. : I played football twice today, and needed to wash my kit again, as I'll be playing tomorrow, though I hope we'll play better than we did this evening, shrug. I had a problem with gnome-bluetooth's wizard, a couple of days ago, that I couldn't reproduce when running under gdb. Turns out that I'm too slow at typing or something, and the problem was a race (though a slow one). Or at least, my Wacom Bluetooth tablet driver is. I was wondering in which tree it was lost. You'll still need a patch to bluetoothd though. Simplez! Simple Pairing support now in gnome-bluetooth. After a furious hacking session (and a bunch of paper-drawn mockups), Simple Pairing support is now in gnome-bluetooth. 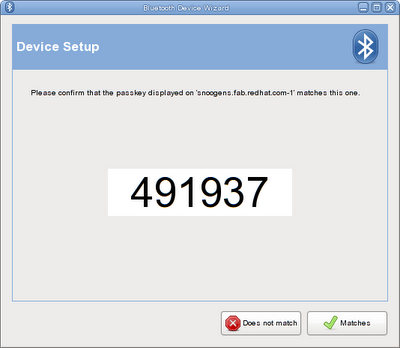 Simple Pairing is an optional part of the Bluetooth 2.1 spec, which makes pairing Bluetooth device simpler. For most devices, simply check that the passkey matches on your computer and the device, or for headsets, do nothing, and voila, paired. Code is in git master, release to follow shortly. Just got back from France, where my best friend was getting married to his best friend. I didn't see civilisation for 5 days, and enjoyed food, wine, and the swimming-pool instead. Just before I left Jackaboutboul interviewed me about the fingerprint reader support in Fedora 11. I hope I gave enough credit to Daniel Drake and Ray Strode for their work, without which mine wouldn't look half as good.